Kakurinbo is of old Japanese architecture. 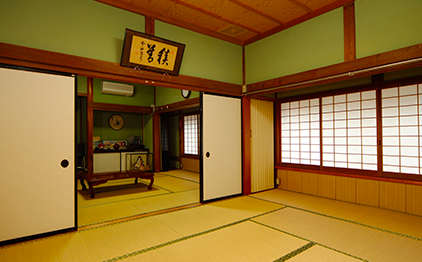 We've retained the traditional structure, and rooms are separated only by a fusuma (sliding door). Fusuma allow for the flexbility to accommodate varying party sizes, by opening or closing the fusuma to adjoining rooms. Please join us knowing that staying at Kakurinbo is like staying at your Japanese grandmother's home in Japan's countryside. Toilets, baths, and sinks, are communal. Yukata robes are available for use as pajamas during your stay.